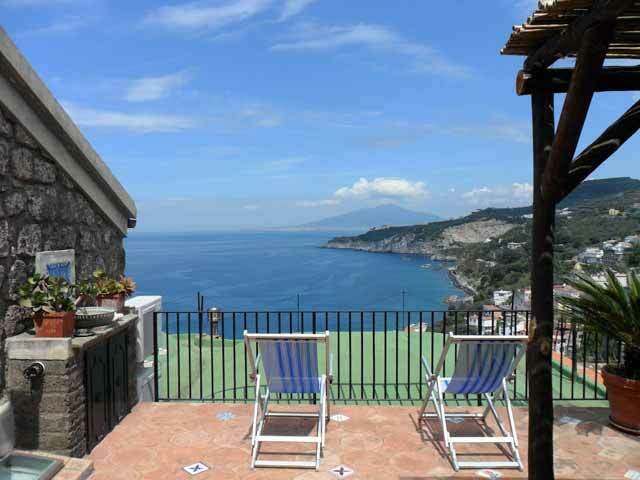 Casa Rustica is a charming vacation apartment on the Sorrento coast with stunning views over the coast and surrounded by the great view of the typical village of Marina della Lobra. 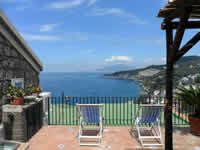 Sonia is the perfect place for a romantic vacation in Sorrento. 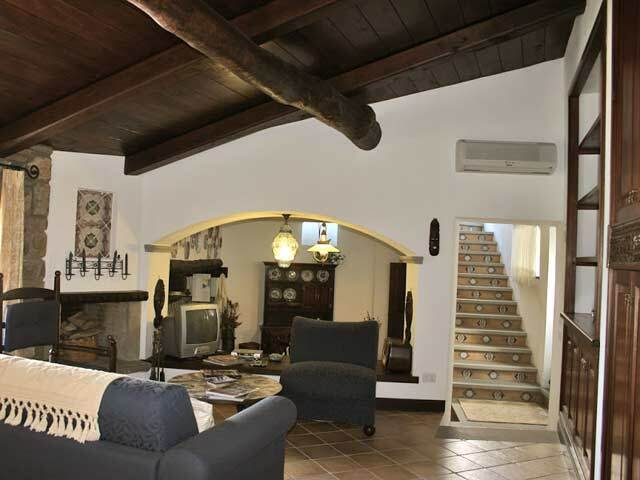 Casa Rustica is an independent house on two levels. 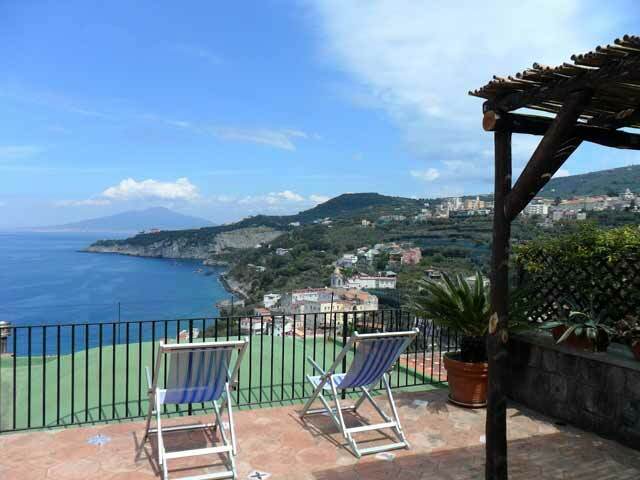 To reach the apartment you will walk through a nice path that can bring you to the small port of Massa Lubrense: Marina della Lobra. During the summer period from here it is possible to go to Capri and Amalfi Coast. A selection of restaurants will give you the chance to taste or typical fish courses. bathroom with shower, washing machine. (access by 15 steps about): double and panoramic bedroom with air conditioning/heating, bathroom with shower. Direct access to the panoramic terrace equipped with table, chairs and sun chairs. Indoor activities: Massage (on request), chef service and breakfast (on request). Outdoor Activities: Tennis, horse riding, swimming, walking, sailing, diving, fishing, cooking class, wine tasting, cheese tasting, excursions, shopping. 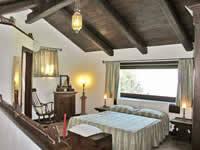 Nearby services: Internet point, restaurants, bar, hair stylist, spa, banks, post office. 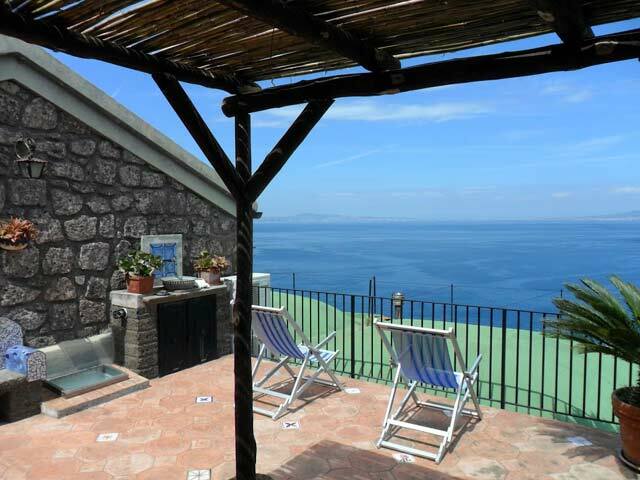 Nearby attractions: Pompeii, Herculaneum, Caserta, Capri, Campi Flegrei, Ischia, Ravello Music Festival, Naples. 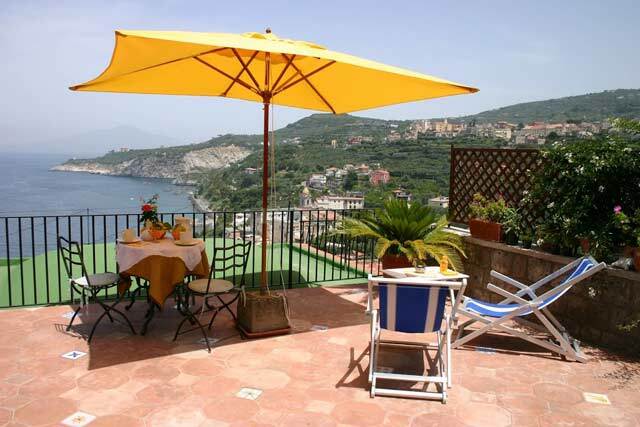 Nearest beach: Marina della Lobra (rocks) at 2 kms, Marina di Puolo (sandy beach) at 4 kms. Car: We suggest to rent a car. 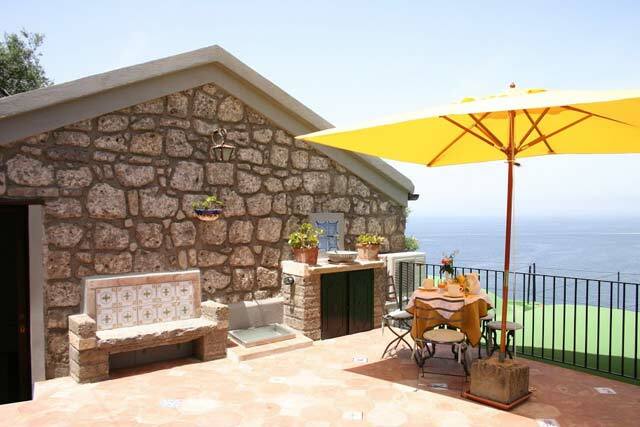 The access to Casa Rustica apartment is just walking (100mts). It is possible to park the car in a free area on the street (very quiet and safe). 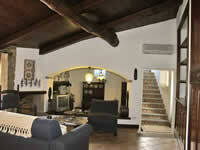 Check in is preferred on Saturdays from 15.30 to 20.00. For arrivals after 20:00 until 22:00 there is an extra charge of EUR 50.00; no arrivals will be accepted after 22.00. 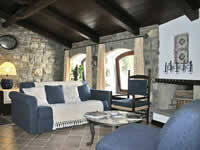 Those who arrive after 22.00 will need to check at our office at 9.00 a.m the following day. The approximate arrival time, way of arrival (by air and/or using a car or public transportation) including flight or train details and contact number needs to be communicated to us by email at least a week before the arrival. This will help us arrange a meeting that addresses all your needs and questions. In case you are delayed, please give us a telephone call to advise the estimated time of arrival. Guests must depart by 10.00 a.m. For departures before 9:00 a.m security deposit can be held and sent back by electronic draft to your bank after checking any damage caused during the stay. Departure time has to be communicated upon arrival or during the rental period and at least 3 days before departure. For apartments that accept animals an extra charge and an extra security deposit will be required. 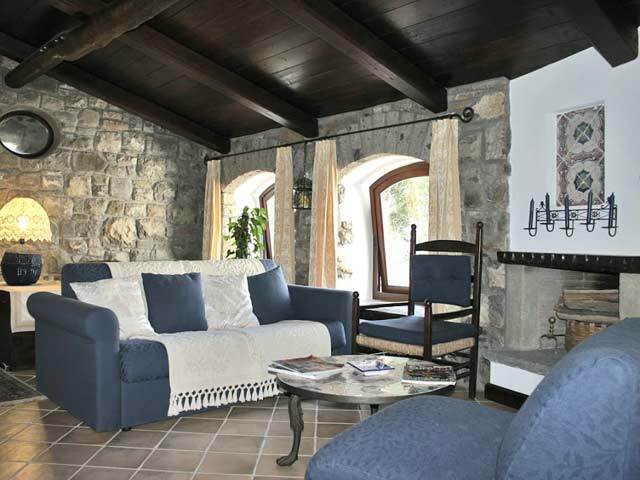 A deposit of 40% of the rental cost is required and payable on booking. Confirmation will not be effected until the whole of the deposit has been received. The balance must be paid within 45 days before arrival. Any extra cost must be paid in cash and on arrival. Cancellation percentage charged on the rental cost.